Over 17 days, pedalling more than 800-kilometres with a group of 18 others, including my intrepid mom by my side, I explored Tamil Nadu and Kerala, two South Indian states from coast to coast. Powered by chai, I experienced a unique and life-changing bicycle adventure through a country rich with culture. I had never imagined touring India on bike until I met Dave Trattles. My mom and I met Dave at separate speaking engagements, in Ottawa and Toronto respectively. Dave, an established photojournalist, shares his travels through visual storytelling, spreading his enthusiasm and passion for photography with communities across the globe. Through charismatic narration, Dave positioned himself as the seasoned organizer of the South India Bicycle Adventure. Delighted by Dave’s energy and enchanted by his outlook on life, my mom and I decided to undertake this adventure to India together, celebrating our friendship and shared passion for pedalling. Smiled back just as wide at this chai vendor in Cochin. Our journey started in Chennai where Pongal, a four-day harvest festival, was being celebrated earnestly. This coastal capital was bustling — the streets were adorned with Kolam, a traditional form of painting using rice flour, and people were clothed in their finest garments. In the background, motorists honked incessantly, and the humidity weighed the thick tropical air down which was a potent mix of both the fragrant and foul. Surrendering to sensory overload, I joined the city’s crowded streets in celebration. The world’s second most populated country, with an estimated 1.3 billion, India hosts some of the world’s most overcrowded cities and surprisingly, some of the most peaceful, remote villages. 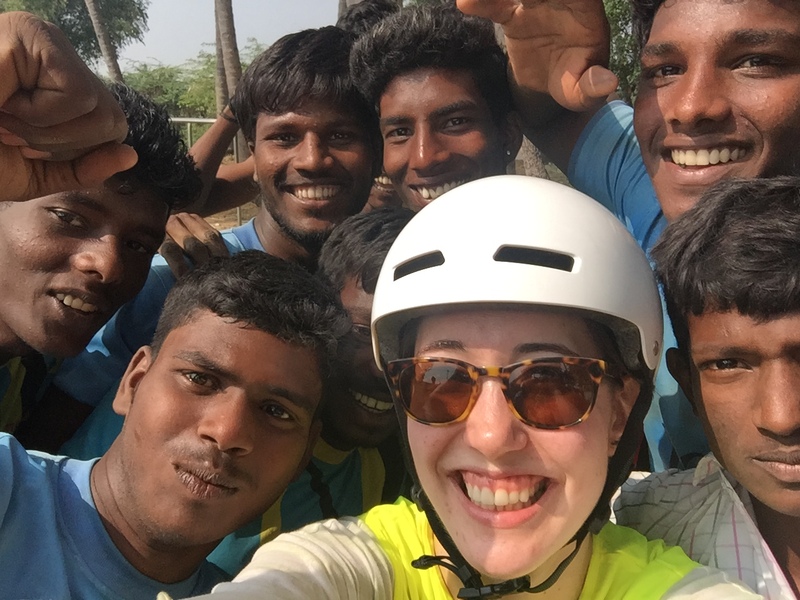 Regardless of language barriers, climate, traffic and the sheer number of people, South India proved no more difficult to tour by bicycle than other countries. Apprehensive until I arrived, safety was never a concern while in India. I never felt vulnerable or uneasy. Instead, I was offered directions, invited for chai and surrounded by kindness. I experienced generosity early in the trip. On our first day of cycling on our rugged mountain bikes, my mom and I had the pleasure of meeting Nigin, a college student pedalling the same route. Intrigued by our bright neon yellow vests and pale complexions, he asked where we were going. Noticing his proud display of books on his bike, we pulled over to learn more about his journey. He rides to share his joy of reading, a passion both my mom and I strongly support. Without flinching, he pulled a book from his bag and extended it to us. Expecting nothing in return, Nigin’s selflessness was our first and lasting impression of what India had in store. Cycling in the left lane took some adjustment. The combination of tightly packed dirt and nicely paved roads were readily equipped to accommodate cyclists and small vehicles. We marvelled at the volume of goods precariously roped onto well-loved bicycles. For locals and tourists, South India’s primarily flat terrain made cycling easy, enjoyable and affordable. Views of Tiruchirappalli from Ucchi Pillayar Temple. India’s culture is among the world’s oldest, and the variation of languages, religions, music, food and customs are evident within. Cycling through less travelled, yet culturally rich areas offered remarkable experiences. Far outweighing bicycles, the most common modes of transportation in South India are tuk tuks and scooters. Driving assertively and confidently, their movements were brisk yet predictable. Free of large vehicles and harsh weather conditions, the roads were smooth, still proving ideal for bicycles. Spotted a bright worshipper in Palani, Dindigul. The sense of community is contagious in India. No matter the setting — roadside, chai stop or temple — we were welcomed and made to feel like locals. As we passed schools, uniform-clad children overflowed into the busy streets, cheering full-heartedly as we rolled by. After riding to our daily accommodations, we had the opportunity to visit some of the world’s largest temples. We experienced acts of worship known as puja on several occasions, and all were as unique as the temples themselves. Ushered by worshippers to participate, these prayer rituals allowed us to connect with them spiritually. The ceremony was enchanting, and the embrace I felt stayed with me long after the ceremony concluded. Personal beliefs aside, it was a profound display of devotion, respect and the power of community. Curious school girls in Thanjavur flocked to my mom and I. Despite being astoundingly caring and generous, many residents in rural parts of India continue to live in poverty. A whopping 75 per cent of rural households in India have a daily income of less than $2 a day. Nevertheless, the kindness and hospitality of its population are unwavering. Electricity is fickle, but natural light is abundant. Clean drinking water is lacking, but fresh fruit grows freely. Education is a privilege, but learning is not limited to the classroom. Discernable throughout the country, India’s working class is widespread and labours tirelessly: chai vendors, tuk tuk drivers, shop keepers, field workers, goat herders, ropemakers. Through basic necessities, hard working communities are able to create a sustainable livelihood. India is incredible and it offers a variety of landscapes and cultures that is like nowhere else on earth. A definite trip highlight was cycling into Kerala, known as “God’s own country.” Scaling the Western Ghats was challenging and breathtaking, but the effort was worthwhile. We were able to enjoy the scenery of Munnar’s panoramic tea plantations, sampling tea and celebrating our accomplishments as we descended the scenic countryside. My first encounter with wild elephants at Chinnar Wildlife Sanctuary. Humidity and sunshine were a constant in India, making shade all the more desirable. The fauna and flora were widespread and picturesque. Alongside free roaming cows and goats, we spotted peacocks and monkeys as we cycled towards Thattekad. We even experienced a rare interaction with a majestic family of elephants at Chinnar Wildlife Sanctuary. India’s traditional food was delicious. The dishes were spicy, rich, flavourful and diverse. Roadside coconuts provided much needed electrolytes on humid days. We indulged in unrivaled samosa prepared fresh at an easily missed roadside shop. Vada, paratha, halva, plantain chips and fresh fruit were plentiful. To my delight, I tried my hand at throwing naan on the side of a ceramic Tandoor oven in Marayoor. Travelling more than 800-kilometres from Chennai to Cochin by bike and a few hundred more by minivan and houseboat, I fully experienced South India. My explorations, interactions and observations offered countless opportunities for self-discovery and reinforced my appreciation for those around me. Being navigationally challenged is not without its merits, as some of my favourite memories were experienced while cycling off the beaten track. Unexpected interactions make travelling gratifying and fulfilling. We floated peacefully on a houseboat along the Kottayam waterways. We discovered early on that this adventure was different from other cycling trips, simply because India’s culture is so complex, present and available throughout the route. Handing us maps and supporting individual exploration, Dave encouraged us to get to know India’s people and their customs. Seizing every moment, we immersed ourselves in the local cultures. His South India Bicycle Adventure gave us the opportunity to engage and to explore the country’s beautiful landscape and rich heritage. Sharing this adventure with my charismatic mom added an element of excitement. Savouring the occasion to bond as women on wheels, South India afforded us a comfortable balance of exploration and introspection. India’s unhurried, but constant pace was perfect to explore on bicycle, allowing strong realizations to steep like fine chai. Most strengthened by this experience is my sense of good fortune and privilege. Amidst the hustle of everyday Western culture, these liberties are often forgotten. In today’s divisive world, India renewed my hope in humankind. India’s warmth will stay with me long after the sun’s glow wears off. No matter the road travelled, be curious, be kind, be grateful. Sunset viewed from Thillai Natarajar Temple in Chidambaram.